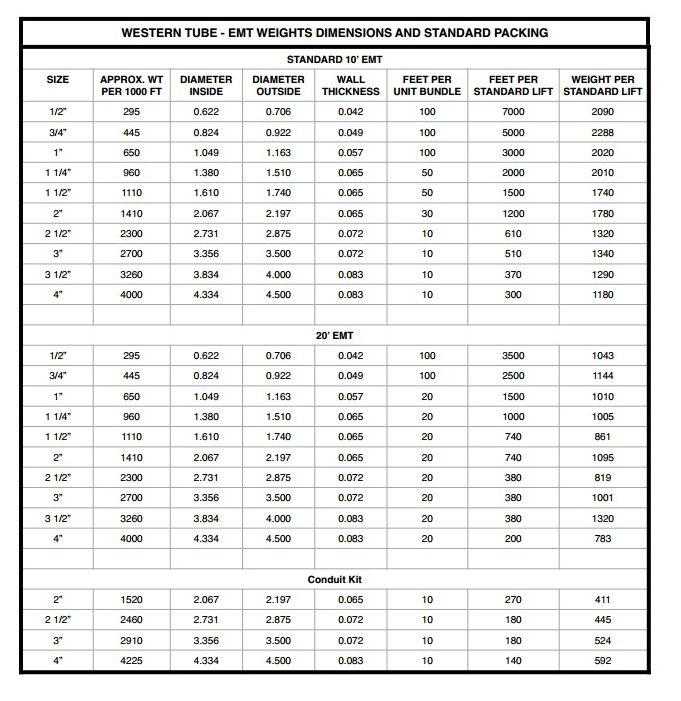 WESTERN Electrical Metallic Tubing “E.M.T “ provides uniformity of weight, wall thickness, O.D. and I.D. concentricity, ductility and maximum strength. Western E.M.T. is made from strip steel, high frequency welded. A continuous hot galvanized process is employed to coat exterior surfaces evenly and smoothly; a special transparent secondary coating provides further protection against corrosion. Manufactured in accordance with Under-writers Laboratories UL-797, American National Standards Specifications C-80.3, Federal Specifications WW-C-563A. Approved by the 1987 National Electric Code article 348, for open, concealed and concrete slab installations. Quality Controlled each step of the way – Regular tests for weld strength, Malleability, plating thickness and uniform smoothness of interior coating provides you with conduit of highest quality…. Western E.M.T. Easy to bend- Perfect bends and offsets can be made quickly with lightweight easy to handle Western EMT. Easy, trouble free wire pulling- A special baked-on coating on inside of surface of Western E.M.T. reduces friction and provides extra ease in wire installation. No chipping, cracking, peeling-Outside surfaces are galvanized with zinc coating for superior corrosion resistance and long-lasting, dependable service. Special protective coating is then applied. Provides a lifetime of safe electrical installations. Low in cost – strong, durable. Contact us: for Pricing & Information.